Over the last decade, Kendall Simon has gained a unique perspective on Michigan’s natural areas. While conducting research on the state bald eagle population, she has enjoyed the view from the tops of some very tall trees. 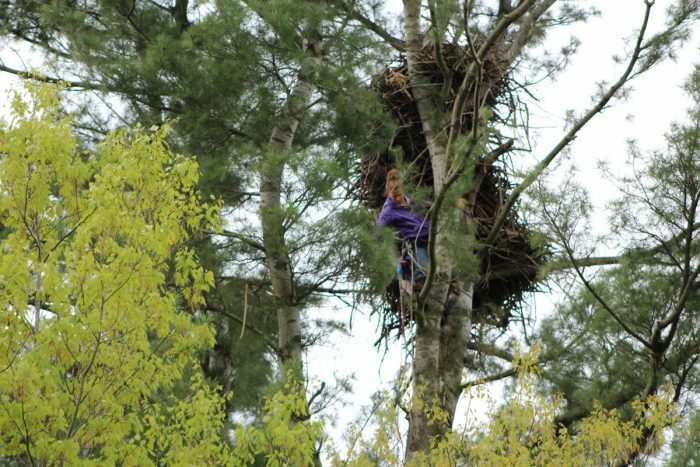 According to the records, there are over 800 trees in Michigan holding active eagle nests and Kendall has climbed them all at one time or another. At all times, she has been a driving force behind the bald eagle biosentinel research project to study the eagle population in the Great lakes basin. A Great Lakes Restoration Initiative grant, awarded by the Michigan Department of Environmental Quality funded the research while Doctor Bill Bowerman in the Environmental Science and Technology Department at the University of Maryland provided the consistent leadership that converts theory into solid results. First as a field technician and later as a team leader and trainer, Kendall and her colleagues have made significant contributions to the body of knowledge that has grown and evolved for nearly sixty years. Most in the field credit Sergej Postupalsky, a University of Wisconsin Ornithologist with Czechoslovakian origins as the pioneer who first studied Michigan Raptors in the late 50’s. He was concerned about the apparently declining population and wanted to conduct an accurate census. Because nests are visible from the air, Postupalsky hired a team of pilots to canvass the state conducting an aerial survey. They counted 34 young in 52 nests throughout the state in 1961, the first year that records were kept. These results formed a baseline from which to measure population growth but more importantly the blood samples drawn from nestlings showed evidence of chemical toxins including DDT and PCBs. Toxin levels in the bloodstreams of tested eagles as well as in the environment began to drop. 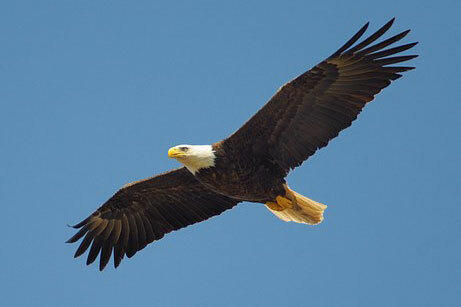 Bald eagles and other sea eagles are the top-level predator of aquatic food webs. They accumulate high levels of environmental pollutants in their bodies and many times, show the greatest effects from these chemicals. These studies therefore have far-reaching implications for the health of all natural species and provide critical learning about the effects of water pollution on wildlife in the Great Lakes basin. Dr. Bowerman has recently begun using the long-term bald eagle population in the Great Lakes to look at effects of global climate change. Eagles nesting along Great Lakes shorelines and tributaries have shown a significant trend of nesting as much as six weeks earlier than when project first began. This is one of the greatest changes observed in nesting chronology in the world for any bird. 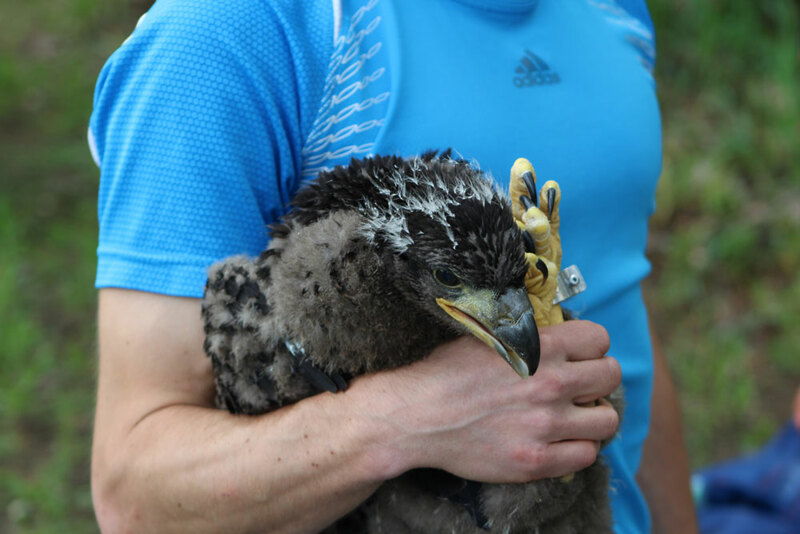 In addition, he is examining size changes in nestlings as another possible indicator of the impacts of a warming climate. Each year, in the first week of May, Kendall’s team made a plan to monitor all occupied nests in Michigan, beginning with the most southerly locations and working their way north. Timing is important. A three or four person team is typical with each technician assigned a specific task. One teammate is the designated climber while the others perform analysis on the ground. 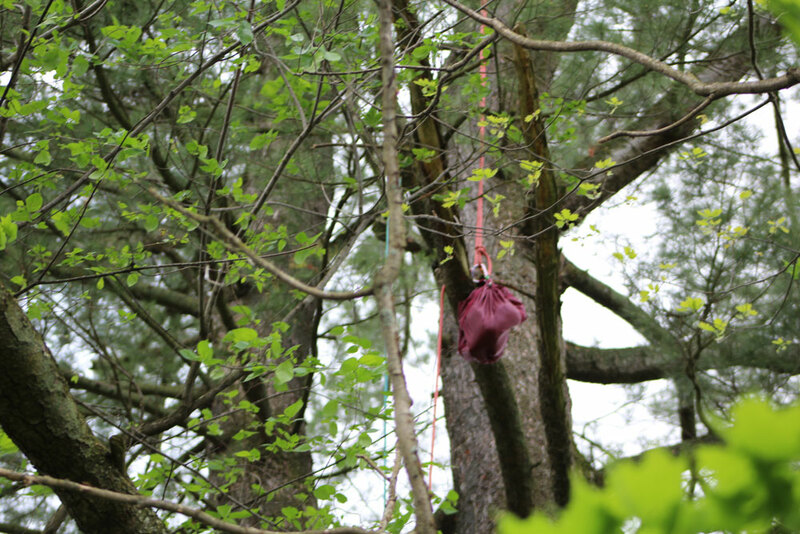 When the climber reaches the nest, she attaches a pulley to a sturdy limb and threads a line with a clip on the end. 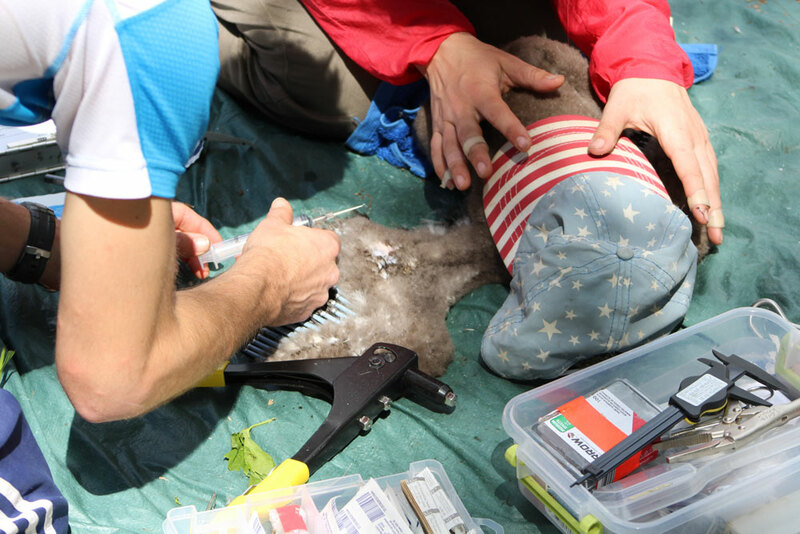 She gently removes an eaglet from the nest, places the bird in a padded duffle bag and lowers it to the ground crew. They remove it from the bag, weigh it, measure talons and beak, and take a blood sample and some feathers for lab analysis before returning it to its home. The team repeats the process until they have tested all the nestlings. A ball cap is a critical accessory in this process. It turns out that if you lay a baby bald eagle gently on his back and cover his face with a ball cap he tends to relax without struggling to get loose. On a cloudy Sunday afternoon around the middle of May, the team visited a nest in a Hemlock tree in Mecosta County overlooking the Muskegon River. As Kendall made her way to the top of the tree, one of the adults circled the nest voicing her displeasure at the uninvited home invasion. Unfortunately, the outcome on this day was unfortunate and not typical. Kendall found one young bird, dead in the nest. This was puzzling since the landowner who regularly keeps watch through a spotting scope had witnessed the parents feeding their offspring on Friday. One possible explanation at the time was that the bird died from exposure following a cold rain on Saturday. To find out for sure the team conducted the usual experiments and sent the carcass to the MSU’s Diagnostic Center for Population and Animal Health in East Lansing for analysis. The necropsy report confirmed that the main cause of death was due to aspergillosis, a fungal respiratory infection. This type of infection is not rare but an eaglet with a healthy immune system is typically able to fight it off. Kendall notes that this specimen was slightly underweight and may have been suffering from malnutrition. That is all the test results can tell us but everyone knows Michigan can be a harsh environment in early spring. Despite this setback, the eagle population in Michigan has shown a nearly complete recovery and this nest and others within the boundaries of the Muskegon River watershed have always been productive. 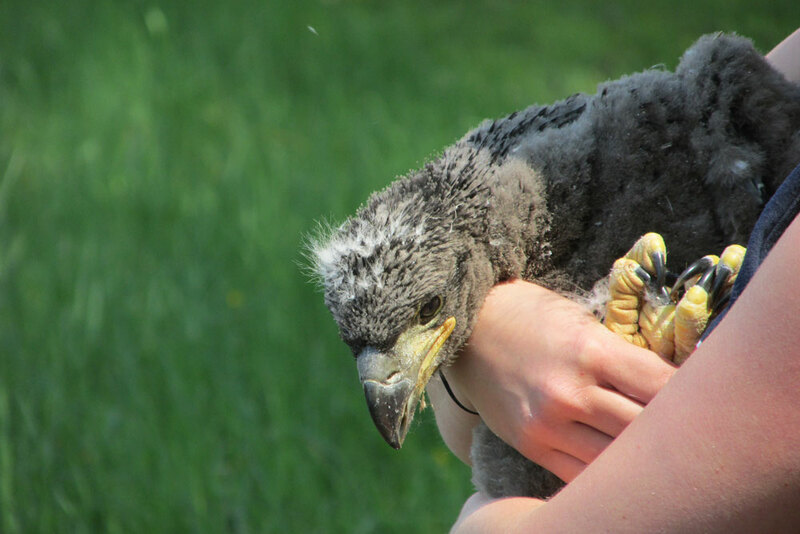 In any given year, 40 to 50 mating pairs of adult eagles produce healthy eaglets in nests within the seven counties of the watershed (Clare, Mecosta, Missaukee, Montcalm, Muskegon, Newaygo, Osceola ). Since much of their daily food supply connects in some way to the Muskegon River, this represents a positive data point regarding the health of the river. Kendall’s team counted 843 young in 835 active nests last year in Michigan, definitely a robust population of young birds. In fact, the program appears to be a victim of its own success and this summer may be the last. Kendall had planned to leave the program after the 2017 season. She received her PHD from Maryland and 2016 and felt it was time to pursue other interests. She returned this year for a farewell tour of some of her favorite places, to climb some trees and see old friends one last time. Kendall Simon attained her PhD degree in Ecosystem Health and Natural Resource Management from the University of Maryland in July of 2016. Her MS and PhD research used bald eagles in Michigan as environmental indicators of Great Lakes ecosystem health. 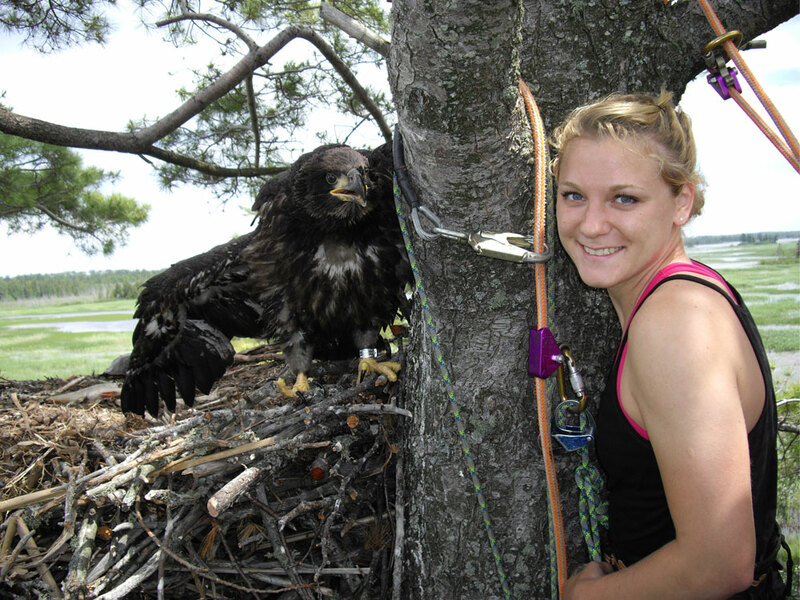 Through this research, she budgeted, hired, organized, and led 4 teams of 2-3 staff members each, while flying nest occupancy surveys in fixed-wing aircrafts and climbing hundreds of bald eagle nests to sample and band fledglings. Because bald eagles are a highly charismatic, and also threatened species in Michigan, this field work required constant communication and collaboration with multiple universities, government and park agencies, energy industries, private landowners, and survey pilots. For her MS thesis, she analyzed 51 years of Michigan bald eagle productivity and nest location data to determine population source-sink dynamics, and possible density-dependent effects using ArcGIS. For her PhD dissertation, she determined major sources of bald eagle mortality in Michigan using 24 years of necropsy data. Her dissertation also included toxic equivalency factors and their corresponding ecological significance for the state as a whole, as well as specific watersheds using a variety of self-taught statistical software and methods including R Studio and SAS. She has presented her research at multiple conferences and proceedings, as well as to the Michigan Department of Environmental Quality, Department of Natural Resources, U.S. Fish and Wildlife Service, and local Native American tribes to guide remediation and listing/delisting decision-making for ecological areas of concern and beneficial use impairments throughout the state. Other wildlife projects that she has been involved with include trapping golden and bald eagles using a rocket-net system and conducting black bear den checks to attach telemetry units, as well as collecting fathead minnow and wood duck eggs to assess selenium contamination along riverine systems surrounding iron-ore mines in northern Michigan. In Kendall’s current position at O’Brien and Gere, she evaluates groundwater contamination due to landfills containing solid/non-hazardous waste at 35 sites in Ohio, Illinois, Maine, and Texas. She is actively involved with every step of the evaluation process, including on-site groundwater sampling, performing statistical analyses to determine exceedances of state and federal standards, and writing groundwater monitoring summary reports for the Environmental Protection Agency. She also assists with the various stages of Superfund site remediation efforts, including soil and air sampling in the field, as well as data analysis and reporting for baseline human health and screening-level ecological risk assessments. In addition to her wildlife experience and knowledge, she is also an avid horseback rider, rock/tree-climber, hiker, and outdoor enthusiast.